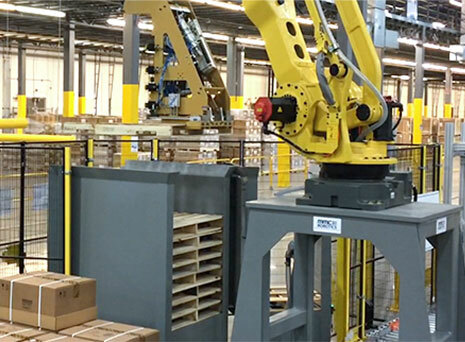 For many end-of-line packaging applications, production line speeds allow us to utilize the robot to perform the pallet dispensing process. To achieve this, we have developed standard pallet frames/magazines and numerous end-of-arm tools that automate the process. To integrate robotic pallet dispensing into a cell design, our in-house controls group typically programs inbound conveyors to give the robot time to pick and place the pallet while our design engineers enhance the end-of-arm-tooling to accomplish multiple tasks.